This year marks the 20th anniversary of the creation of Sonic the Hedgehog. And nothing says "old, possibly dead but worth a token remembrance anyway" like commemorative postage stamps. Making things even less exciting is the fact they're from Belgium, so most of us can't even use them. At €4.99, you're paying €1 per stamp (these are meant to be collected, not used), so if you do use them, whatever it is you're sending in there, make it count! 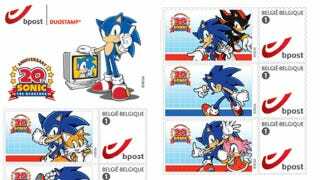 Sonic fans interested in picking the pack up, you can get them online at Bpost's store.